I received the below post in my Inbox this morning, with permission to publish it, but a request to keep their name unknown. The author’s comments are in response to the L.A. Times article “News outlets prove able enablers in Sheen’s meltdown”. I’ve added portions of the original article where I felt appropriate, to better understand the author’s point. This is a wonderful article. It supports my stance that Hollywood (television media and the like) are about the money. In spite of the fact we see a person having a complete meltdown in front of us, it doesn’t seem as if anyone is trying to get the Charlie the professional help he so desperately needs. Major news outlets, led by ABC and NBC, have been relentless in recent days in aiding and abetting the epic meltdown of a celebrity who happens to be the biggest star on the biggest comedy hit at rival CBS. Given the amount of air time they have gifted him, it’s as if the producers on the other networks have fallen under Sheen’s spell. Having said that, you cannot help someone who doesn’t want to help himself. You also can’t make someone see what they don’t want to see. Charlie thinks he’s better than anyone else and he doesn’t see himself as an addict. He has money and he obviously has some ‘power’, since he’s been on the tele so much more than if Two and a Half Men were still taping and on air! Pop Culture (or plain social culture) being what it is, we’re all curious about the celebrities and their current struggles in life. It makes more money, since how often do “good or positive stories” garner the interest (money for stations) of viewers? Charlie has provided a gravy trainwreck with his manic radio and television interviews. Maybe he’s not going to allow anyone else to make money off of him or his talents, which is why he’s gone to Twitter. I’ll bet someone’s making money having Charlie on their site, radio or tv station. And he’ll take credit for it. Now that his twin sons have been removed from his harem, I mean home, there’s no telling what he’ll embark on next. He’s going to fight it because he wants to “win” and “losing is not an option.” He uses terms that I think corroborates the stories of his gambling addictions. Yes, he has talents for which he’s been greatly compensated. 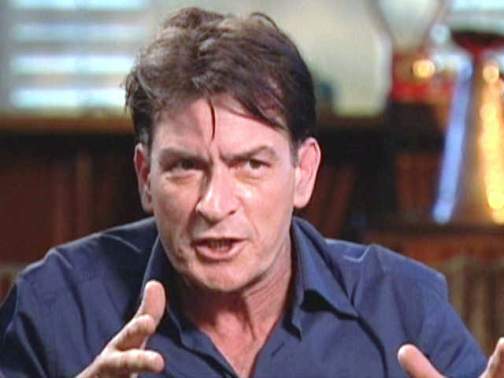 Of course, there are those higher up who has made more money in projects involving Sheen. He seems to forget projects he’s been in, he wasn’t in it by himself. Four Emmy nominations, no wins. That must just piss him off! I think people, myself included, need to take a step back from this latest novelty coming out of Hollywood. No doubt, he needs serious professional help. BiPolar or not, he seems to have a substance abuse problem. Doesn’t he also have a few physical/domestic abuse records in his file? Three marriages ending in divorce. However, as an actor, he’s got talent. Talent that is currently being overlooked because of his breakneck speed of publicly self destructing. He’s a good actor, but he’s not that good. Either he gets help or we’ll be reading his obituary in the near future. Not that anyone in the news business has been thinking of that in the last few days. A get is a get is a get. 53 queries in 1.945 seconds.